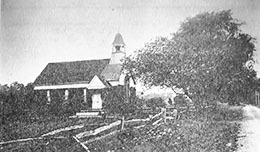 Willow Grove Chapel in the South-side of Scotch Plains marks its 125th anniversary this year. It started as part of a Sunday School project. Local farmers built the small Union Chapel. Eventually, so many families participated that the church was built around the chapel. The chapel has constantly catered to children throughout the years with Bible School Classes and a Nursery School. The Historical Society of Scotch Plains and Fanwood is going to this historic chapel for its February meeting. We will learn about the history of the actual street, what the area was like when the chapel was built and the chapel’s special architecture. The meeting takes place Tuesday evening, February 25th, starting at 8:00PM at the Willow Grove Chapel at 1961 Raritan Road in Scotch Plains. This special meeting is open to everyone. Fellowship and refreshments follow the meeting.